Henley’s research career began in the postwar era as physicists sought to understand how the universe’s fundamental particles interact with one another. Through a combination of his theoretical work and rigorous experiments, his research helped physicists assemble the Standard Model, today’s framework of fundamental particles and forces. Parallel to his research life, Henley was a leader and administrator at the UW, culminating in eight years of service as dean of the College of Arts & Sciences from 1979 to 1987.
Henley was born in Germany on June 10, 1924. He earned his undergraduate degree in electrical engineering from the City College of New York in 1944 and a doctoral degree in physics from the University of California, Berkeley in 1952. After short stints as a research associate at Stanford University and lecturer at Columbia University, Henley joined the UW faculty in 1954 as an assistant professor. He was promoted to associate professor in 1957 and full professor in 1961. Before becoming dean of the College of Arts & Sciences, Henley served as chair of the UW Faculty Senate from 1971 to 1972 and chair of the Department of Physics from 1973 to 1976. 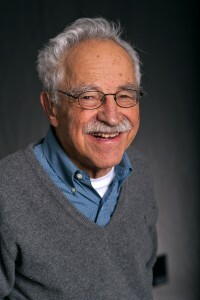 Along with Wick Haxton, he was a central force in building the UW Institute for Nuclear Theory and served as its inaugural director from 1990 to 1991. Henley became a professor emeritus in 1995. Over the course of his research career, Henley studied “symmetries” in nuclear physics. Symmetries are patterns in the theories regarding the fundamental, physical interactions of our universe. Henley and his contemporaries investigated the properties of subatomic particles to understand when they behave consistently with a given symmetry and when they do not. Henley’s work largely focused on three types of symmetry: time-reversal, whether forces are the same forward and backward in time; parity, whether a force or interaction is the same as its mirror image; and isospin, how forces and masses of the particles vary with their charges. Experiments suggested by Henley and performed by colleagues at the UW Nuclear Physics Laboratory — now the Center for Experimental Nuclear Physics and Astrophysics — revealed new details about symmetries, and uncovered conditions when subatomic particles deviated from symmetry. Based on his findings, Henley proposed new experiments. His theories and ideas later helped scientists assemble the Standard Model, the framework for fundamental forces and particles that is still in use today. In 1989 the American Physical Society awarded Henley the Tom W. Bonner Prize in Nuclear Physics, “for the decisive and creative role which he has played in using the nucleus as a laboratory for the study of fundamental interactions,” noting that, “his seminal studies of time-reversal invariance, parity nonconservation and charge symmetry breaking have motivated a generation of important experiments.” In addition to this honor, Henley was elected to the National Academy of Sciences in 1979 and the American Academy of Arts & Sciences in 1995.
Henley also wrote five books on physics. Outside of the office, he was a passionate supporter of the UW’s Transition Program and Early Entrance Program at the Robinson Center for Young Scholars, and taught physics there for almost two decades until he retired at age 90. Henley also played the piano and supported the arts. He was a founding board member of the UW World Series, now the Meany Center for the Performing Arts. Survivors include his widow, Elaine Henley, a UW clinical professor of medicine in metabolism, endocrinology and nutrition; a daughter, Karen Henley, an assistant professor of psychiatry at Boston University and a psychiatrist at Boston Medical Center and the Boston Health Care for the Homeless Program; a son, Brad Henley, a UW professor of orthopedics and sports medicine; and four grandchildren.